I did a post a while ago explaining how to modify Opera Mini’s jad file to hide the unneeded touch keypad that displays at the bottom of the screen on some touchscreen phones. The post included a link to the modified Opera Mini. I received a request asking for a copy of the latest signed Java version of UC Browser modified to hide the keypad. 4. Upload the file to a file sharing service that is easy to use in your phone browser. 5. Visit your file’s url with your phone browser and click the modified mini.jad link to download it to your phone. If that didn’t work or you don’t have a PC or are just in a hurry, here’s are links to the latest signed version of the UC browser as well as some older versions. To install, go to is.gd/uc95touch with your phone’s browser. To install, go to is.gd/uc94touch with your phone’s browser. UC Browser 9.3 (24-Sept-2013) A “full” (non-cloud) UC Browser release. According to UC, the new features in this version are: a smaller install package, user interface changes, increased stability and two new themes. To install, go to is.gd/uc93touch with your phone’s browser. UC Browser 9.2 (5-Aug-2013) A “full” (non-cloud) UC Browser release. New features: smaller file Size, optimized night mode, new hot words search, password saving on HTTPS webpages is now supported. To install, go to is.gd/uc92ts with your phone’s browser. UC Browser 9.1 (25-Jun-2013) A “full” (non-cloud) UC Browser release. New features include: bitmap fonts let you read pages in Arabic, Persian, Urdu, and Hindi, even if your phone doesn’t support these languages, support for the Bengali language , support for eMule and FTP downloads and bug fixes. To install, go to is.gd/uc91ts with your phone’s browser. UC Browser 9.0 (25-Apr-2013) A “full” (non-cloud) UC Browser release. New features include: Fast Video and Audio Playing using the UDisk cloud service, password manager works on more sites including Facebook and GMail, improved usability especially on touch screen phones and bug fixes. To install, go to is.gd/uc90ts with your phone’s browser. Short Link: is.gd/uc89touch To install, go to is.gd/uc89touch with your phone’s browser. UC Browser 8.8 (25-Dec-2012) Another “full” (non-cloud) UC Browser release. New features include: increased download speed, customizable shortcut keys and an improved File Manager. Short Link: is.gd/uc88touch To install it, go to is.gd/uc88touch with your phone’s browser. UC Browser 8.7 (7-Nov-2012) This is a “full” (non-cloud) UC Browser release. New features include: users can switch between multiple accounts when signing in to a website, long press the OK button to invoke the Actions menu, users can save pages directly without changing the page name. Short Link: is.gd/uc87touch To install it, go to is.gd/uc87touch with your phone’s browser. Short link: is.gd/uc860touch To install it, go to is.gd/uc860touch with your phone browser. 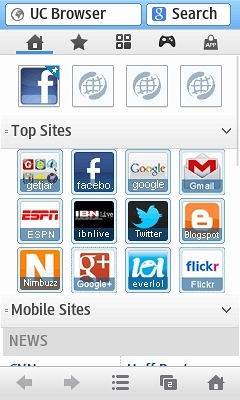 UC Cloud Browser 8.5 (6-Sept-2012): This is first non-Beta version of the UC Cloud Browser, a redesign of the original UC browser optimized for smaller download size and faster page loads. New features in this release are: new user interface with different menus for touch screen and non touch screen phones. Supports copy and paste in the URL bar and all input fields. New screen brightness setting. New share image on Facebook feature. New Game Center free game download store. Short link: is.gd/uc85touch. To install it, go to is.gd/uc85touch with your phone browser. 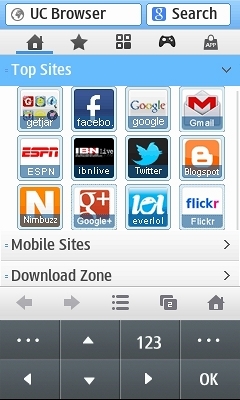 UC Browser 8.4 (23-Jul-2012):. Major changes are: simplified theme installation, the traffic statistics display is back, the link to browsing history has been moved to the top of the bookmarks page and a there’s a new Tools > Phone menu option for making phone call or send a texts from within the browser. See my review for more about 8.4: UC Browser 8.4 for Java Released With Bug Fixes, New Features. UC Browser 8.3 Alpha (7-Jun-2012): New features include; UDisk cloud based storage and the App Gallery, a new home screen tab providing quick access to UDisk, bookmark backup and restore and the Quick Reads news deader. Short link: is.gd/uc83touch. To install it, go to db.tt/ajY88aHm with your phone browser. UC Browser 8.2.1 Production (non-Beta) (20-Apr-2012): New features include a built in RSS reader and bookmark backup and restore. See my review for more details. Short link: db.tt/ajY88aHm. To install it, go to db.tt/ajY88aHm with your phone browser. Short link: is.gd/uc82touch. To install it, go to is.gd/uc82touch with your phone browser. Short link: is.gd/uc8touch. To install it, go to is.gd/uc8touch with your phone browser. This entry was posted in Browsers and tagged Java ME, LG, Samsung, touchscreen, UC Browser, Virtual Keypad by Dennis Bournique. Bookmark the permalink. I am rosh, denis i try to modified that, but when i opend jad file with wordpad then its change into text document. And when i save the file its show text document, hw i Can modified plz reply me in details. I cant Modified plz reply fast or email me. What’s the error message when you try to open the browser? Does the unmodified version from wap.ucweb.com work? Oh, it seems an error occured! This site is temporarily unavailable,please try it later.??? The site you are tying to reach is down. where is link of uc 9.0? First time u played prank by giving old link and rename it by newer name ! Mr. Bournique, can u plz post the latest UC 9.0 java with virtual D-pad removed. uc 9.0 version release. Plz remove its d pad. :-] dennis,just want to compliment you on your site,its full of helpful information.sir,I downloaded a ton of games,3 versions of uc,one browserand opera mini.i was having very fast browsing w/the 8.9 version,but last fdw days the pages half load and just sit there.are there too many browsers there and which should I stick with (huawei U7519 ). also,it took me an hour(page by page) to get to ” newest comments.” Is there a shortcut? thanks! UC 8.9 probably got corrupted. Delete it and re-install. The only way to find the best browser for you and your phone is trial and error. The latest one is usually the best but if you have problems with it try progressively older ones until you find one that works. Comments are listed newest first under each post. There’s also a link to to the ten most recent comments in the sidebar on every page of the site’s PC version. I get INVALID DESCRIPTOR error message, and it won’t install. There’s not much you can do other than report the issue on the UC Browser forum and hope that they fix it. Use Opera Mini or the phone’s built in browser for Facebook in the meantime. What error do you get when you try? I meant uninstall and re-install UC Browser, not the phone software. why uc 8.9 is not support my samsung c3312 when i start to browsing it .it show error,however it support my same handest before some days and before when i installed new software in my mobile . Please help me for browsing it again! If UC 8.9 worked before, uninstall and reinstall to fixit. my phne is lg gs500v cokkie plus……. If you modified the jad and installed the app using the jad the keypad should not be there. I’m not sure what went wrong but check your work. If you can’t figure it out paste the .jad text or a link to it in a comment and I’ll take a look. Am trying modified Facebook application for every phone version 3.0.1 it’s run normaly 240×300 screen size ……. I don’t understand. If the modified app is running normally what do you need help with? Also what make and model phone is it? But we have Meridian as mediaplayer , but also moboplayer does not work. Do you please have a suggestion? I can’t help you troubleshoot “does not work”, it’s too generic. Please describe what happens when you click the Play button or link on a video on http://m.youtube.com using the UC Browser? The purpose of this post was to show people how to modify apps for touchscreen. Now that you know how it’s your turn to do the work. I don’t have the time to modify apps on request for everyone. i have some pblm denis, i want more uc browser in my samsung c3312 phone and i instal various version, but all be replaced in one for same name ucbrowser. How i do now say me yar. You need to change the MIDlet-Name in MANIFEST.MF so each version has its own name. See: http://forum.ucweb.com/forum.php?mod=redirect&goto=findpost&ptid=25551&pid=313515 for instructions. You need to put the jad in your Dropbox Publc folder. It’s a Beta. I will wait for the official final release on the main UC site. If you want the Beta follow the instructions in the post to create your own touch optinized version. The problem is probably due to the limited capabilities of your phone’s media player and nothing to due with UC Browser. I bet you get the same results downloading the files with the phone’s built in browser. I’m just a blogger and not part of the UC Browser development team so I can’t fix UC. Please turn off your caps lock when commenting here. It’s ugly, hard to read and makes you look like you are yelling. Download links for the latest touch screen version of the UC Browser are in the post. I don’t understand what files you are trying to play or what playing files has to do with UC Browser. In any case fixing bugs in UC Browser is beyond my abilities. UC Browser isn’t a video player. It tries to open videos in the phone’s native media player. So only video sites that work with the phone’s built-in browser will work in UC Browser. when i exit, all downloaded files and saved pages removes. I exit mannualy. uc 8.8 is amazing plz add here modified as soon as u can denis. uc browser 8.6 and uc browser 8.7 is not working in my lg t375.